Hard News: Where are all the polls at? Yes it does rather incline one to doubt the methodology used by polling companies. 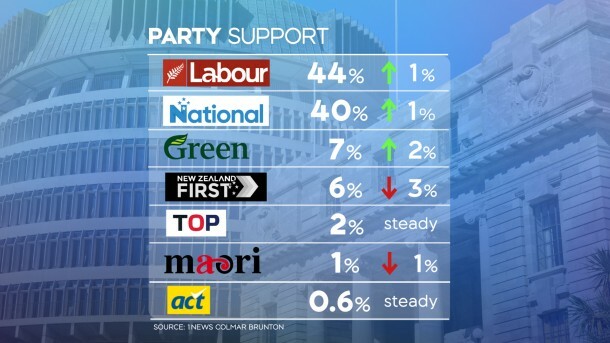 Corin Dann commented that Colmar Brunton is being consistent in putting Labour ahead three polls in a row. The margin in tonight's is four points - greater than the margin of error. Yet the National lead of ten points in the TV3 poll the other day was also greater than the margin of error! We're supposed to have confidence that both represent political reality, while they contradict each other. I did pass exams in statistics at the University of Auckland, but that was 48 years ago and my perception of the discipline as voodoo science hasn't changed since. Any reader who takes it seriously is welcome to explain why, if they reckon I'm wrong; I won't bother arguing! Interpretation of scientific results is inherently subjective - despite most scientists being addicted to their denial of this fact. Interpretation of scientific results is inherently subjective - despite most scientists being addicted to their denial of this fact. This isn't true. Scientists are generally aware of the difference between reporting facts and offering interpretation, and scientists generally seek to test their interpretations by constructing experiments which will either convert interpretation into fact or dismiss it as erroneous speculation. Perhaps you are confusing scientists with paid consultants. Just a comment about margins of error. At risk of 'splaining, most folks assume that the margin of error means the "real" result will be the stated number plus or minus the margin of error. But these errors have a bunch of assumptions and what they really mean is the "real" number is PROBABLY within that range but it could be well outside that given number. But there are other issues, a passing familiarity with stats should tell you that the margin should be smaller on the zero side. That is, if the number given is 20% then it should be +say 5% and minus say 3%, so right up front you know the margin of error is calculated in an unusual manner and you should treat it with suspicion. But the biggest problem with those margins is they make assumptions about the sampling. They assume the sample is random and the survey companies are struggling with that now. They also assume the samples have certain distributions (remember normal distributions from school?). Those assumptions are necessary to do simple stats but it's never certain the assumptions are valid. It's possible to do better statistics and my guess is internal party polling probably uses much more sophisticated models and error reporting but statistics makes most folks head hurt and the media is just plain reluctant to try and present anything complex. The result is, these entertainment polls with silly margins of error. They make for entertainment and sound bites and tweets but as for actually representing the opinion of the population - they're horrible. And then there's the media phone-in/online audience opinion polls, with no attempt at random or representative sampling. Those would be "entertainment only" ... if they were entertaining rather than just infuriating. Scientists are generally aware of the difference between reporting facts and offering interpretation, and scientists generally seek to test their interpretations by constructing experiments which will either convert interpretation into fact or dismiss it as erroneous speculation. Yes, this general practice is a laudable mental discipline. I was referring to the myth of scientific objectivity, and the way scientists participate in public life. The media expect them to report facts but they normally get opinions instead. Since I graduated with a BSc in physics long ago, there's been an unending stream of such media misrepresentation of contraversial issues. Most obviously in recent years in climate science. Scientific assertions about whether or not the evidence means anthropogenic global warming is driving climate change have masqueraded as fact for many years because those making the claims (on both sides) believe they are reporting facts when they are actually reporting their interpretations. There have been studies that show pretty compellingly that people who believe themselves to be objective (eg scientists) are more subject to confirmation bias than average. However, when making comments on the meaning of data there is a difference between comments made from knowledge and comments made from ignorance. Both can be wrong but one is more likely to be wrong than the other. I rarely trust my accountant* to advise me on medical matters. *lol as if I'd have an accountant. NAT 40% LAB 39.5% GRN 9% NZF 6% MAO 2% ... rest irrelevant. Least reliable of the pollsters, traditionally. But as a very rough guide, confirms the "all to play for" narrative rather than the TV3 Newshub loner. New Scientist magazine had and artical about those studies. Some findings, according to New Scientist, are that people who are not scientists but engage with recreational science are less subject to confirmation bias than average. My cynicism obviously spiked, so I went and made a cup of tea. I rarely trust my accountant* to advise me on medical matters. I think it's worth pointing out that one of the reasons practically all the polls before the 2017 UK general election were wrong was because they systematically under-represented the youth vote. That was deliberate: after the polling debacles of 2015, the pollsters made adjustments to their sampling to reflect what they expected turnout to look like, based on who actually turned up to the polls two years earlier. So polling samples were weighted towards older voters, on the assumption that most of the young wouldn't vote. We now know that that was completely wrongheaded. It made no allowance for young voters' enthusiasm for Corbyn-style Labour policies that had not been on offer in 2015 (in particular, the abolition of tertiary fees). And it didn't anticipate the success of Momentum and other Labour-affiliated organisations and campaigns in mobilizing the youth and student vote, particularly around residential university campuses. That's why the Conservatives unexpectedly lost seats like Canterbury (main campus of the University of Kent) and, perhaps, Ipswich (home to the newly established University of Suffolk). Could something similar happen in NZ? It's quite possible, but one of the reasons UK Labour was so unexpectedly successful in June was because it offered a complete break with the status quo. It promised an end to all student fees, starting in October 2017, for instance, not a "sensible" graduated abolition over several years. I do wonder if NZ Labour's residual tendency towards compromise and "sensible" options might blunt that message and prevent the kind of unanticipated "youth quake" we saw here 3 months ago. But the only way of really proving the pollsters and the conservative newspapers and broadcasters wrong is to actually turn up and vote tactically for a change of government. so far out of whack with last nights Roy Morgon Poll and NBR Horizon poll. Either Reid Research is right on the money or they are 100% wrong and will end up being the laughing stock of the polling community. Horizon polls have come up with some ridiculous numbers in the past, so I would treat this with a truckload of caution, but their latest poll in the NBR is not far off the general picture. On current trend, more than 1 million advance votes will be cast before final election date (despite a shorter timeframe for advance voting!) -- in which case the polls (which legally can't ask anyone how they have already voted) can all bugger off. There's been a lot of coverage of advance voting but less coverage of people not enrolling at all. 97% of the olds, but only 67% of the youngs. That makes any "youthquake" a fairly mild tremor ... so far. It's the difference between Labour having to accommodate Winston or the Greens. 97% of the olds, but only 67% of the youngs. That makes any "youthquake" a fairly mild tremor ... so far. Has anyone reported the late enrolment pattern from last election? Some (very small) subset of the advance votes may also be last-minute registrations, because you can register at the same time as casting an advance vote (though not on the final polling day). But that data is not immediately available.